John Battelle just posted about a new site, Rollyo, that lets you “Create personal search engines using only the sources you trust.” They basically let you do Yahoo searches on just a subset of sites that you choose. “That’s a neat idea”, I thought. But then I quickly realized that its probably pretty easy to do with just using Yahoo Advanced Search. Sure enough, if you type in multiple sites into the “domain” box at Yahoo’s Advanced Search page, it lets you search those multiple sites. In fact, I think it might be a nifty little tool to allow people to create these little search boxes of their own and have it automatically generate the HTML for it. Hmmm … sounds like a good weekend project. I’m sure Google must have the ability to search multiple domains as well, but I couldn’t figure out how to do it. Rollyo takes this concept and extends it a little bit by making it more “social”, you can share your custom searches, combine them, etc. Geeky Info has a post about The Blogging Toolkit, talking about what tools they use while blogging. Here is my list. Firefox – I wouldn’t surf with out. Tabs Rule. Nuff said. Eclipse with the PHP plugin – All my PHP is written with this. Paint Shop Pro – Cheaper than Photoshop but still does everything I need it to. Google Toolbar for Firefox – For spell checking. 77% of People Consult Blogs Before Shopping: Bad Reporting? I saw a post on The Blog Herald today: 77% of people find blogs useful for shopping: survey. The post referred to a BBC article: Shoppers Use Blogs For Bargains. More than three-quarters of those questioned in the research said they had consulted blogs before shopping. I find that statement completely and utterly incredible (as in no credibility). How could 77% of people use Blogs to research purchases when I’m sure that 77% of people don’t even know what a blog is? Neither the Blog Herald nor the BBC article mentioned where the survey results could be found so I did a little digging. I found the following survey results at Hostway.com. The first line in the survey is: Percentage of participants surveyed familiar with blogs. The answer – 63.1%. Have the participants ever referred to blogs to look for information about products or services they were considering buying? I am assuming that the only people who answered this question were those familiar with blogs. (Or else how could they even answer that question?). So if we multiply 63.1 by 23.2 we get about 14%. How did the BBC reporter get a 77% result out of this??? It could be that I am looking at a different survey, but even if that’s true why are the numbers so radically different on two different surveys taken by Hostway? Update I sent a note to Hostway about this and got a response that said “The BBC article was a actually a little misleading as it was actually that 77% of people would use blogs to find information rather than 77% do actually use blogs”. I think that clears things up a little. Bloggers were given the opportunity to see previews of the soon-to-be-released movie Serenity. Unfortunately, all the screenings are full already, so I wasn’t able to try and get tickets. It will be interesting to see how much buzz the movie generates in the blogoshpere this week. They have reserved seating. You can buy you ticket online ahead of time or at the theatre and they will have a seat number on it. No more going to a show early to make sure you can get a good seat together. No commercials. I already paid to see the movie, and they don’t sell my soul to advertisers to make a few extra bucks. They don’t even have the silly THX and Dolby ads. Stadium seating. This is a must for Michele, she’s only 5′ 1″. There is also lots of legroom, and padded, retractable arm rests. Unfortunately seating in “The Dome” is not really stadium seating, so we avoid it. Black-box theatres. The only lights on during the show are the exit lights. The quality of the picture are sound are always great. Ushers in the theatre. They announce every show and hang around to make sure the movie starts properly. I’ve been in other theatres where the movie doesn’t start, or there is something wrong with the projector, and you have to go out to the hall to try and find an employee who cares enough to do something about it. The audience is there to see movies. No one answers cell phones and starts talking, no one has conversions during the movie. As a bonus the theatre is within walking distance of our place. The only time we go anywhere else these days is if a movie we want to see is not playing at Arclight. I noticed that my favorite radio station, Indie 103.1, has a blog, but there is no RSS feed link anywhere on the site! Since I’m a geek, I noticed that they were using WordPress, so I knew that http://www.indie1031.fm/wordpress/wp-rss.php would be the link I need to use. I wrote the webmaster about this, so hopefully they’ll put a nice shiny orange RSS button on the site soon. Michele and I ate at Nobu in the Hard Rock Hotel and Casino in Las Vegas on September 5th. I went there with high hopes that it would be a great sushi experience similar to Uchi in Austin or Roku in West Hollywood. After starting with some Edamame and Vodka Tonics, we decided to have the Omakase – Chef’s Choice for $100 each. This came with 7 dishes. Toro Tartare with Caviar. This was a pretty good dish. I likes the texture and the taste was good too. It came with some type of berry, which we cannot remember the name of right now. 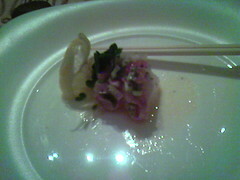 Yellowtail with Salsa. This was OK. Yellowtail has recently become one of my favorite sushi’s, but this one was a little disappointing. Seared Tuna. 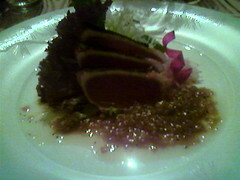 The seared Tuna was a typical seared tuna you would find at any good restaurant. 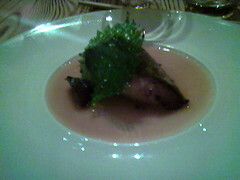 Black Cod with Miso. This was a fairly good black cod. Some black cod I’ve tried has been a little fishy, but this one was fairly tasty. 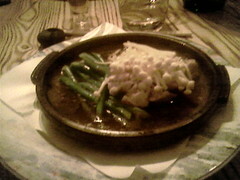 Fish with Enoki Mushrooms and Asparagus. We could not remember what type of fish this was. Again it was a pretty good dish. The enoki mushrooms were a nice change, but not as tasty as the ones I had at Uchi last time. Assorted Sushi. 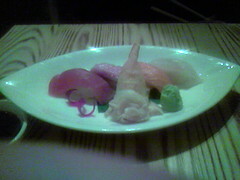 This included Yellowtail, Tuna, Salmon, Fluke and Shrimp. This was OK, but not anywhere close to some of the sushi I’ve had in other places. Dessert. 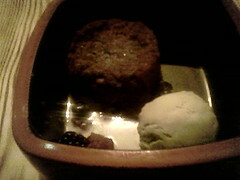 The desert was a chocolate lava cake, ice cream and some berries. Chocolate lava cake is one of my favorites, but this was nothing special. The ice cream and berries were OK. Overall, I was pretty underwhelmed. Considering the cost of the meal and the reputation of the restaurant I was very disappointed. I was expecting to be blown away by many of the dishes, but none of them really lived up to my expectations. The decor of the restaurant was nice. One large wall was made out of small smooth rocks, and I really liked the looks of it. One complaint I had was that you needed to go out of the restaurant and into the casino to go to the restroom. I know it’s like this at every hotel, but when you’re at a nice restaurant like this, it really takes you out of the mood. Service was good. The food came out at a good pace, and empty dishes were cleared quickly. The servers and bus boys were very polite and we we never felt like we were rushed or waiting for anything. They even folded our napkins for us when we went to the restroom. Tranporter 2 was an adequate action flick, much like the first one. Much of the action was over-the-top and a little corny. Some of the stunts were laughably unrealistic. On the bright side there were a lot of interesting fight scenes with Jason Statham doing a lot of prop based fighting. It occasionally reminded me of Jackie Chan, but of course, not as awe inspiring. You are currently browsing the Toivo Lainevool’s Random Thoughts weblog archives for September, 2005.